Postoperative acute exacerbation (AE) of usual interstitial pneumonia (UIP) is a serious complication in the surgical treatment for primary lung cancer combined with UIP. The purpose of this study was to determine the predictors of AE of UIP after a major lung resection. We retrospectively collected data for 40 patients who had been operated on for lung cancer and were diagnosed as UIP based on postoperative histopathological diagnosis. We then evaluated some predictive factors related to the AE of UIP. The incidence of postoperative AE of UIP was 15% (6/40 patients). 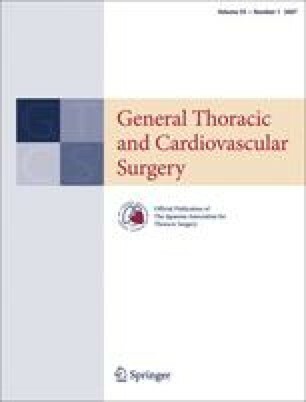 No correlation between patients who developed AE of UIP and those who did not, in terms of preoperative C-reactive protein, white blood cell count, percentage lymphocytes, forced expiratory volume in 1 s, percentage total lung capacity, percentage diffusing capacity of lung for carbon monoxide, and the alveolar partial pressures of oxygen and carbon dioxide. Preoperative serum lactate dehydrogenase (LDH) and serum KL-6 were significantly higher and the percent vital capacity (%VC) was significantly lower in patients who developed AE of UIP than in those who did not. Furthermore, recursive descent partition analysis revealed that %VC (<80.6%) and LDH (≥241 IU/l) could distinguish patients with AE from those without AE. Preoperative %VC plus serum LDH values were considered the predictive factors for AE of UIP after surgery for lung cancer.